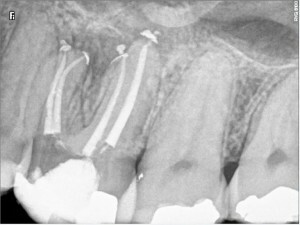 The patient was experiencing a daily constant nagging pain for the last 2 months. 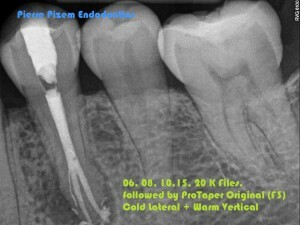 Pain increased along with some gum swelling the during last two days. 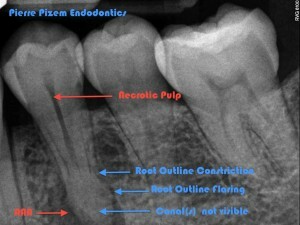 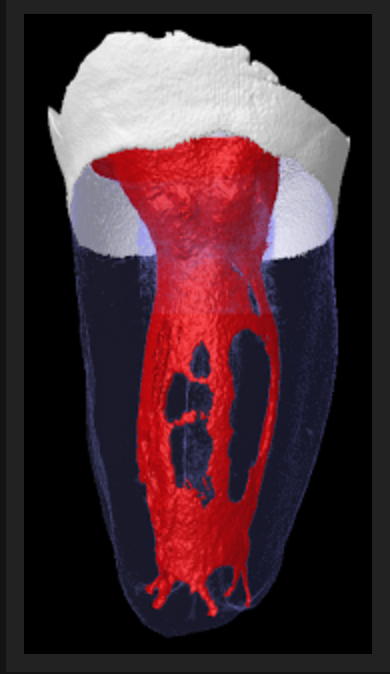 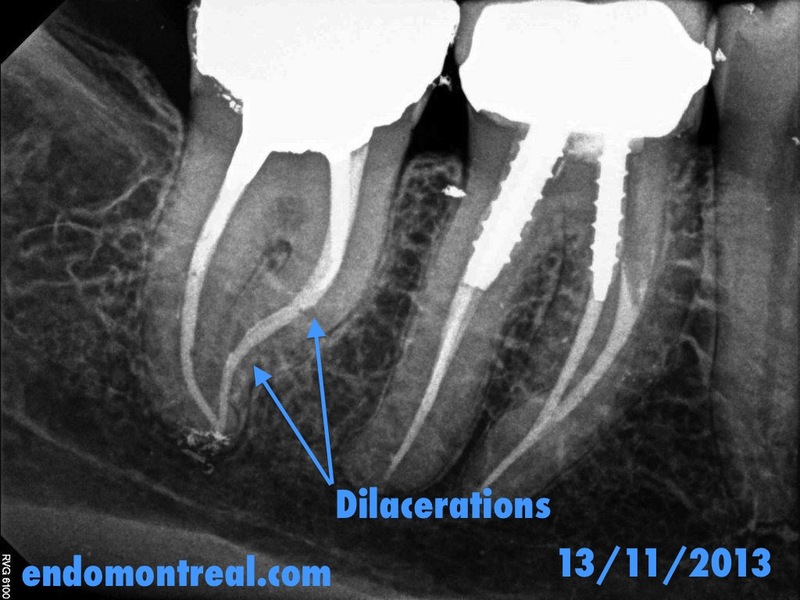 Tooth is calcified thus its root canals are narrow and the pulp chamber is filled with pulp stones. Locating narrow root canals entries can be done in an much easier way under high magnification. 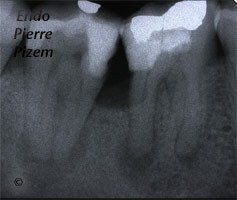 In such instances a dental operative microscope is mandatory. 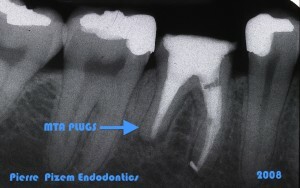 Palatal as well as DB could easily be located after pulp stones removal with Spartan BUC One ultrasonic tip and a P5. 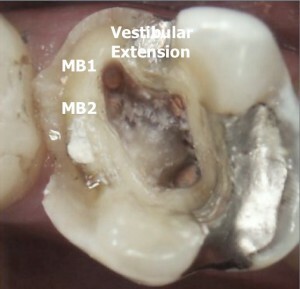 MB1 as been located by extending the access cavity toward buccal. Under full strength microscope magnification, MB2 canal entry has been located under a 2 millimeters thick layer of sclerotic dentin. 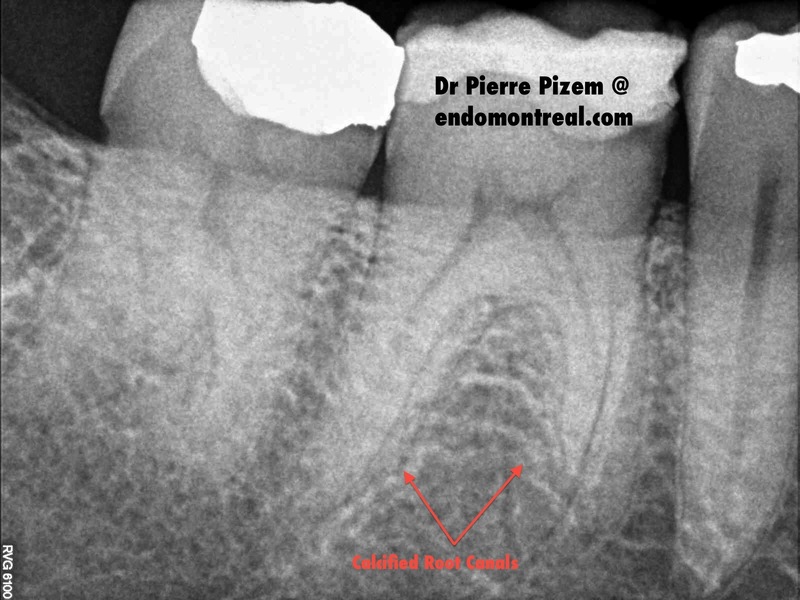 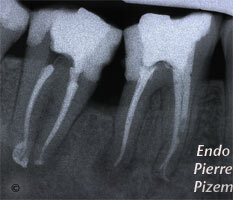 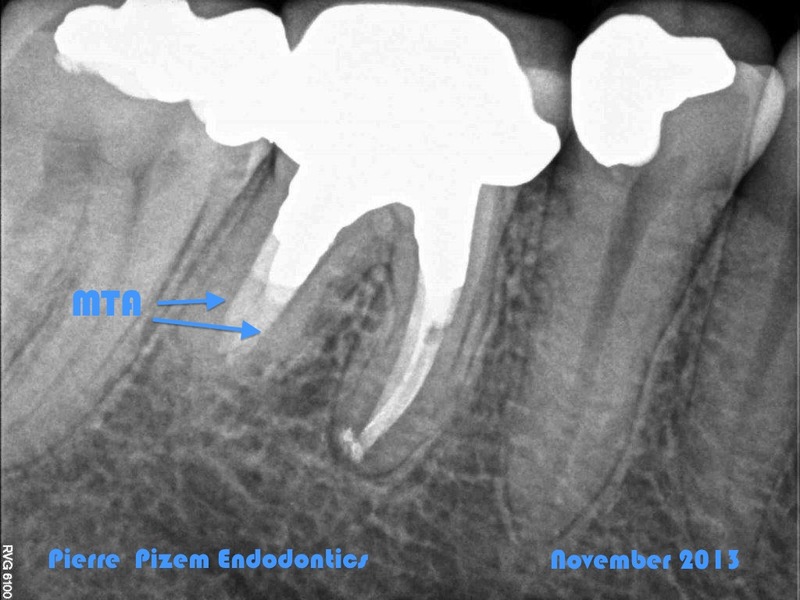 Since a purulent exsudat was present, root canal apical preparations are large. 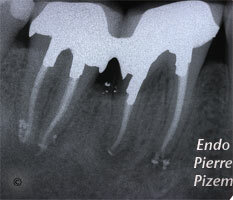 Ca(OH)2 dressing was left in place for ten days and root canals have then been filled in a subsequent appointment. 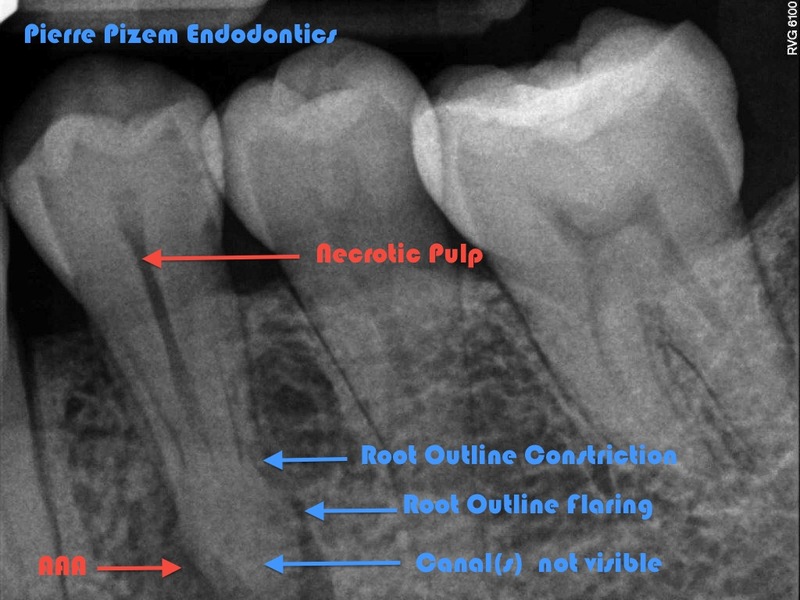 Difficult Root Canal Revision Procedure. 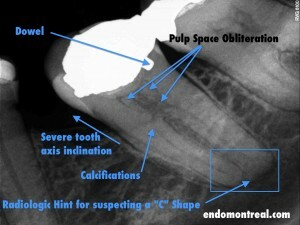 A Critical Options Analysis. 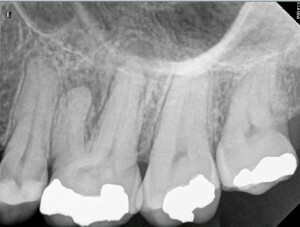 Orthograde Root canal Retreatment ? 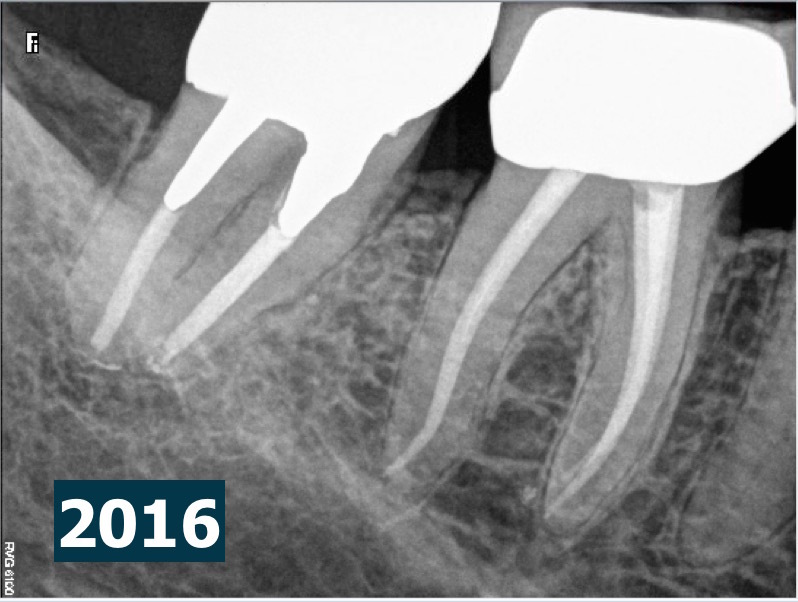 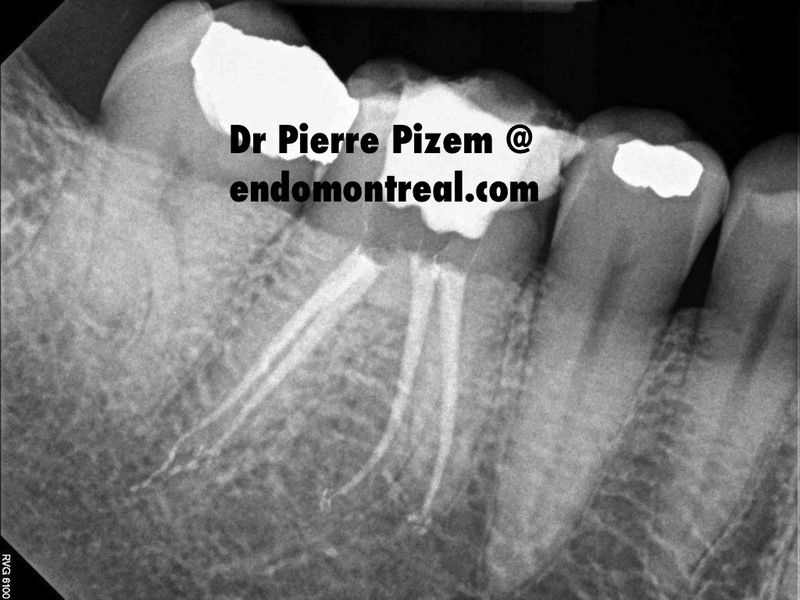 Apical Surgery with MTA Retrofilling ? or extraction and implant? Which of these options would better serve the patient? 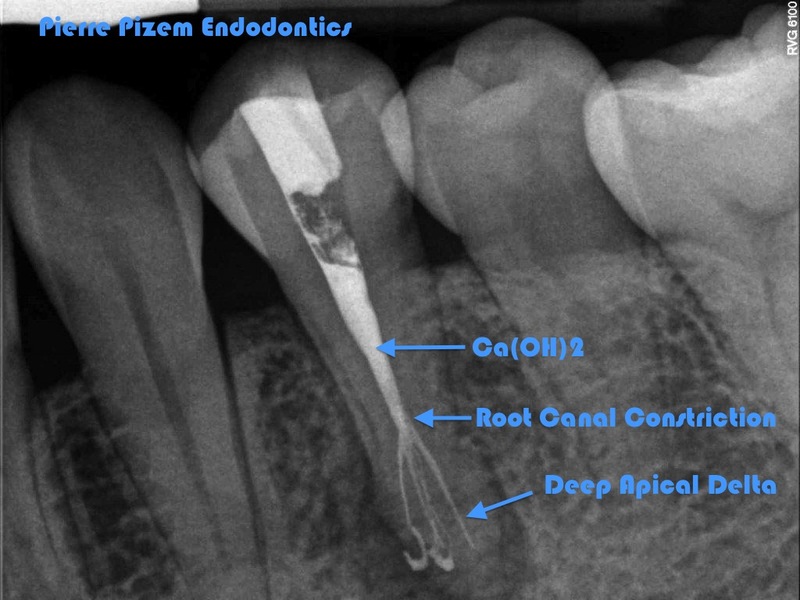 Distal root is short, post is long so this might impair with adequate retrofilling. 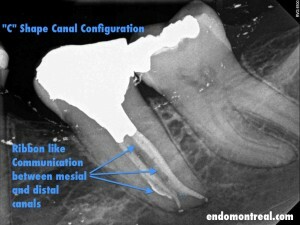 Adding to this statement the event of a second distal canal and we have a recipe for a potential surgery failure. 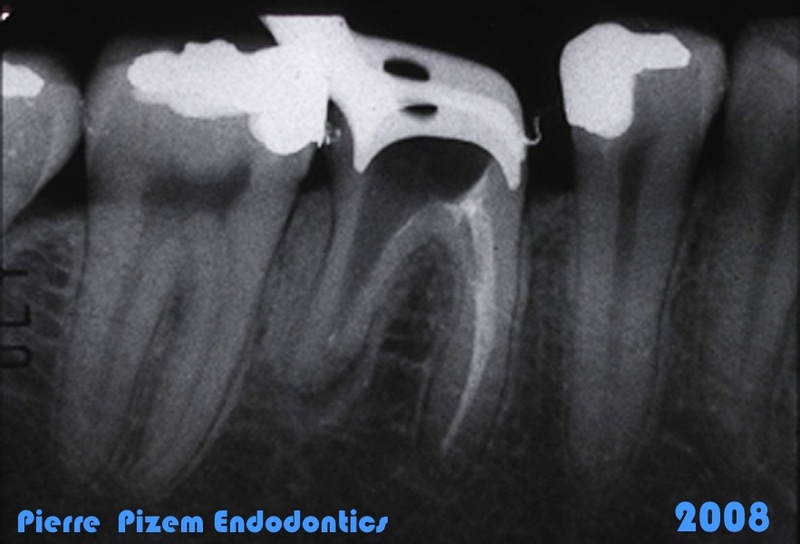 At best, this second canal might make things even more difficult for the practitioner while performing a surgery. 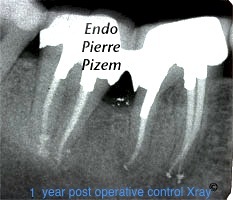 I am also quite often engaged with such teeth, and, to my opinion, removing such a post bares less failure risks than an apico in such an area. For those who feel uncomfortable with big casted post removal or surgery, we all agree that referral is still a better option than a sad straightforward extraction and implant. Up until now this tooth with its redone root canal treatment has been functional for 4 years and is still doing just fine. 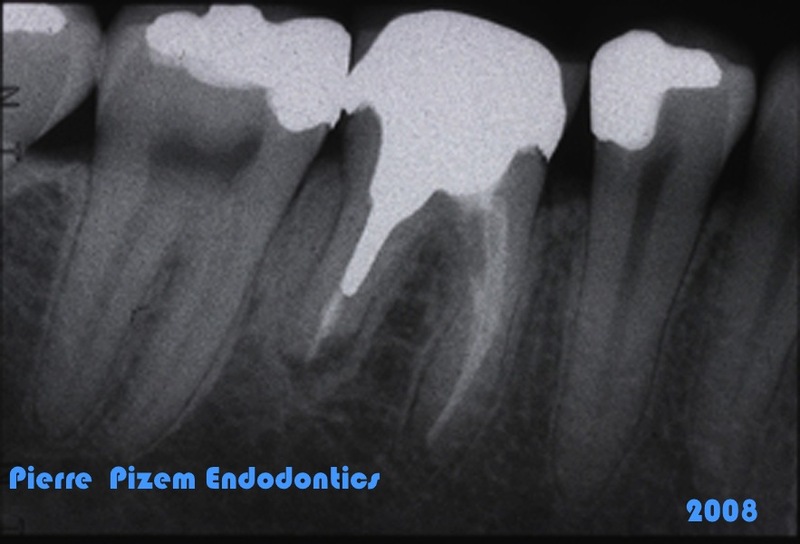 Endodontic Therapy, Amalgam Post & Core Build Up (Nayyar Cores)? or Implant Therapy? 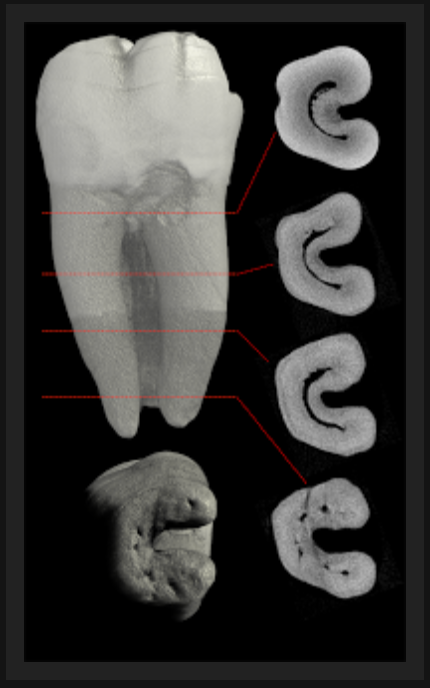 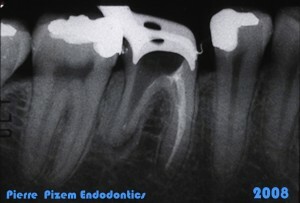 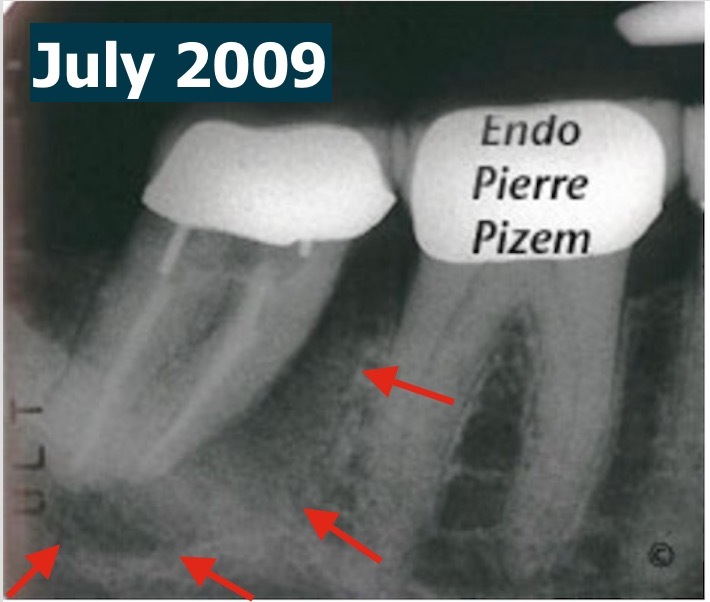 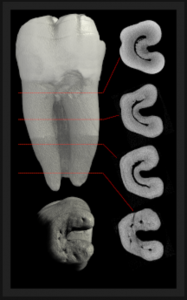 Preserving teeth with Endodontics and Post and Core Build up. 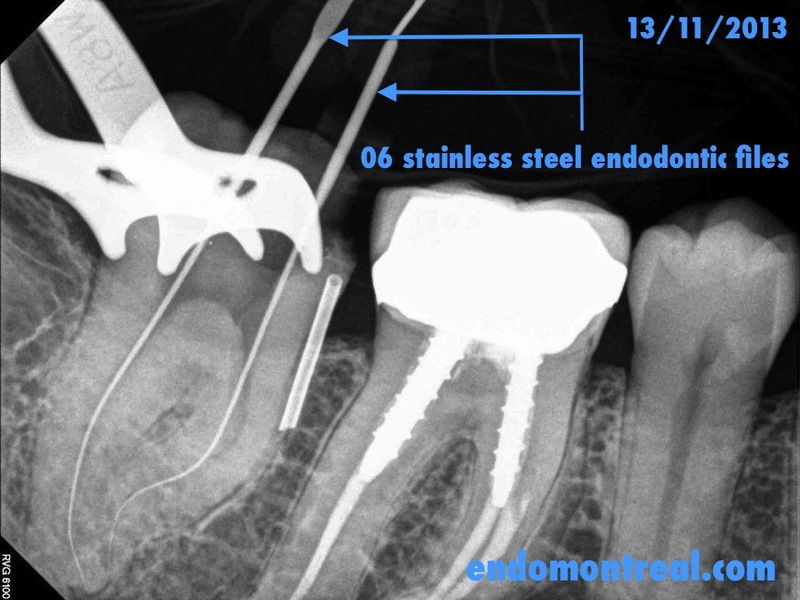 Amalgam build–up for endodontically treated posterior teeth with intraradicular extension Margelos J, Tripodakis AP. 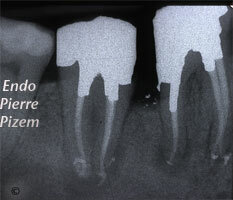 Hell Stomatol Chron. 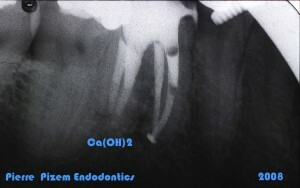 1990 Apr-Jun;34(2):145-50. 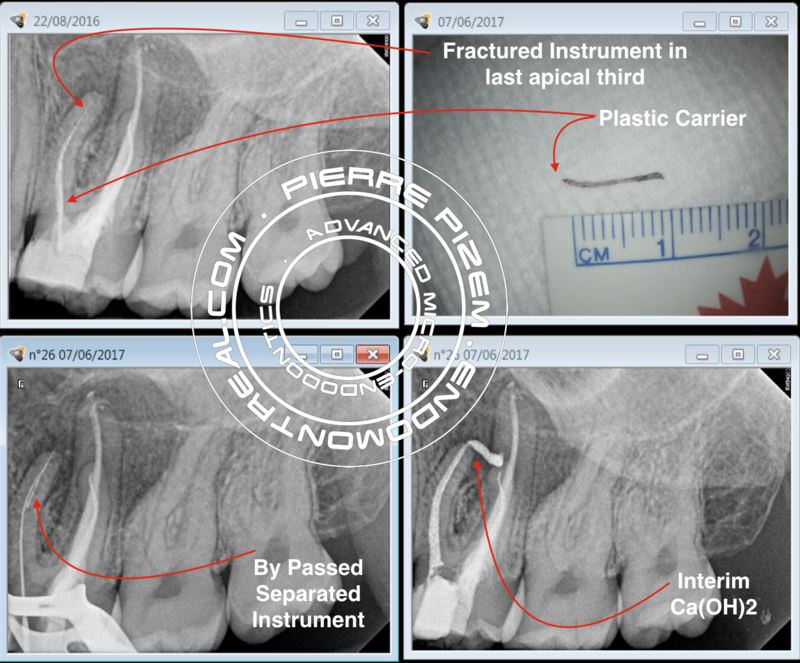 A study of the fracture resistance of nyyar cores of three restorative materials. Ferrier S, Sekhon BS, Brunton PA. Oper Dent. 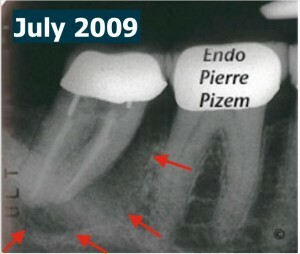 2008 May-Jun;33(3):305-11.